by Betsy: Coloring the cutest little owls! Coloring the cutest little owls! Two more days of the 30 days of coloring challenge to make this card. The "Five Whoots" stamp is by Art Impressions. I tackled it with Copic markers with a touch of Gelly roll white pen on the eyes. On the following day I stamped the background using a Lawn Fawn stamp set Gingham Backdrops with persimmon Versa Magic chalk ink. I had no reason for chalk ink, just trying to match a color from my ink supplies. I had tried to use my same Copic markers and spritz colorless blender before stamping, but I just couldn't make it work. And I die cut the slider window which is also from Art Impressions. 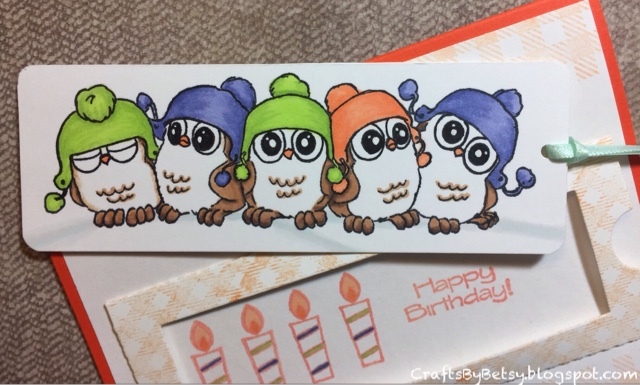 I cut the Owls into a cute little bookmark. Because Copic bleeds through to the back of your paper I doubled up the cardstock on the bookmark. Even double thickness, it slid just fine. Behind the bookmark I stamped the candles and sentiment both by Penny Black. When I try a similar card in the future, I'll try to remember to stamp something behind where the slider window will be in advance! **Update** I just found out about Art Impressions Spring-y challenge, and I think this card is perfect for it! Be sure to check it out here! These owls are the cutest! Sweet card. What a great way to use the slider die! Genius use of the slider die! And of course those Whoots are adorable! Thanks for joining our Spring-y challenge at Art Impressions! 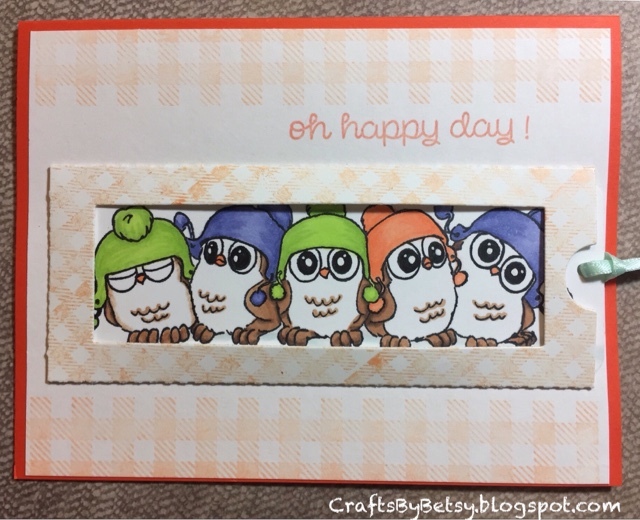 Cute owls!!! So clever to make a book marker! Wonderful book mark, love those owls.